Give your shields a recharge. 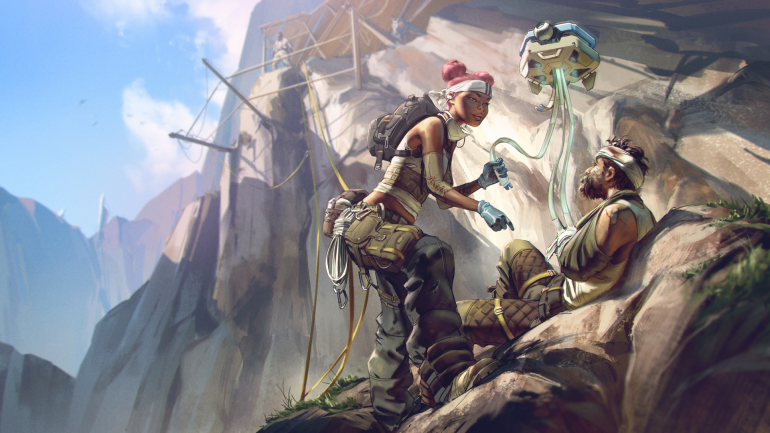 One of the most important resources in Apex Legends is your character’s health. Apex is a battle royale game, so surviving is more important than killing to win a match. Knowing how the game’s health system works is the first step to increase your survival capabilities, and understanding how shields can increase your life is also key to dominate the game. Apex’s health and shield mechanics are simple. These values never vary between characters, and recovery items can’t be boosted by other items or skills. Once you learn how the basics work, you’ve learned it all. All Apex characters have 100 health and no shield on spawn. The only way to increase your total health is by equipping Body Shields that players can find on the ground. When players equip a Body Shield, they’ll see up to four horizontal bars over their health bar. The Common (white) Body Shield grants two bars that are equal 50 shield. The Rare (blue) one grants three bars that are equal 75 shield. The Epic (purple) and Legendary (golden) Body Shields both grant four bars that are equal 100 shield. The damage players can deal to shield and health are the same. Body Shields do not reduce damage taken, they just increase a character’s total health pool. Therefore, an Apex character’s total health can be 100 with no Body Shield, 150 with the Common variant, 175 with the Rare variant, and 200 with the Epic and Legendary variants. Health and shield do not regenerate passively in Apex. You can only recover them with active items and abilities. There are currently three healing items in Apex Legends. You can move while healing, but your movement speed is reduced and you become unable to perform other actions. Syringes (Common), which heal 25 health points and take five seconds to use. Medkits (Rare), which heal up to 100 health points and take eight seconds to use. Phoenix Kits (Epic), which heal up to 100 health points and 100 shield and take 10 seconds to use. If you overheal with an item, the surplus will be wasted and won’t go to your shield. The only item that can recover both health and shield is the Phoenix Kit. Another way of recovering health is by using Lifeline’s active ability, D.O.C. Heal Drone. There are three items in Apex that can be used to recover shield. You can also move while recovering shield, but the same effects of healing apply. Shield Cell (Common), which recovers 25 shield and take three seconds to use. Shield Battery (Rare), which recovers 100 shield and take five seconds to use. Phoenix Kits (Epic), which heal up to 100 shield and 100 health points and take 10 seconds to use. A quick way of replenishing your shield is by replacing it with a new one of the same rarity. If you’re wearing a damaged Common Body Shield and find a new one, it might be better to just switch than spend Shield Cells. The Legendary Body Armor can fully replenish its shield when its user executes an opponent. A few other items and abilities can grant protection to their user, but they don’t affect health pools or shield values in any way. Helmets, for instance, are a great defensive item that doesn’t affect your health pool. They reduce the damage you take from headshots by 30 (Common), 40 (Rare), and 50 (Epic and Legendary) percent. Its Legendary variant increases the speed at which your active abilities charge. Knockdown Shields are a different kind of shield. They only work when your character is down, which means they don’t affect your health pool. They can be activated to protect yourself when down from 100 damage (Common), 500 damage (Rare), and 750 damage (Epic and Legendary). Its Legendary variant allows you to revive yourself. Tank character Gibraltar has special shields that grant him protection but don’t affect his health pool. His Dome of Protection ability protects allies inside the dome from incoming shots for 15 seconds, while his passive Gun Shield protects his torso from shots. This is how health and shield work in Apex Legends. Remember to carry plenty of recovery items the next time your drop in a match, look for good Body Shields, and fight your way to become the next Champion.